Although I've always appreciated style and that which I find beautiful, I would never have presumed to be ahead of the fashion curve. I do believe that this is the first time that we, at WOOL-TYME Kingston have actually come out with a featured style in our newsletter that later was to be found in VOGUE KNITTING Magazine. But here we have it...the BIG COLLAR which can be found on our pattern site as of last month and the incredibly popular Shoulder Warmer which has been up at the store in 2 variations for a few months, but whose pattern will be available on our site within the next couple of weeks. Both are examples of the Big Neck style that looks so luxurious in the Holiday edition of VKM and is as cozy as can be. One of the best things about each of these designs is that they are wonderful for beginner knitters and those who need the cozy wrap NOW! 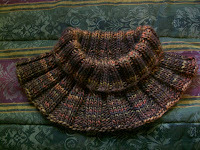 Quick and easy to knit in so many gorgeous yarns. There are some trends that come along that you just gotta love. But speaking of knitting in the fashion world. I had to laugh when I was going through the latest edition of Canadian House and Home magazine and they were showing the beautiful Victorian Toronto house of a designer of high end hand crafted adornments for the home. The main colour used in this house's decor was white (do people actually live in these places???) and in the rich and cozy living room, one of the display pieces was a basket of pouffy white yarn with 2 bamboo needles strategically arranged on a covered ottoman in the middle of the living room floor. It looked lovely but I couldn't imagine any knitter visiting this family being able to leave the yarn in its decorative setting; I for one would have set myself down and ignored everyone else while I cast on a few stitches and set to making one of the big neck warmers as described above. Posted by Now: KnitTraders of Kingston at 9:12 a.m.